In my quest to adopt a more healthy lifestyle, I continue to try different smoothies. I am quickly learning what tastes and textures appeal to my palette. Last week, I came across another smoothie recipe that sounded really tasty, and had all of the requisite nutrients to jump-start my day. Jordan & Miss Lynn’s Ravens Super Smoothie! Prep Time: 5 to 10 minutes. Method: In a reliable blender, puree spinach, kale and orange juice until only flecks of green remain. Add all other ingredients. Blend until smooth, about 2 minutes and serve. NOTE: It’s hard to see the purple tint of the drink, but trust us, Ravens purple! I’ve also added a healthy snack to my daily diet ~ almonds. They taste good and the benefits are endless. For example, almonds reduce the risk of heart disease; regulate blood pressure; are helpful in reducing the risk of cancer; and contain Iron and vitamins which are helpful in treating anemia. There are also several “beauty benefits” of almonds. 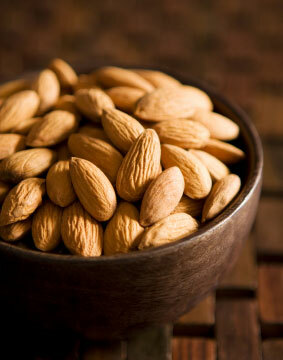 Almonds are rich in Vitamin E which is good for beautiful skin and hair. Almond oil is the best massage oil which rejuvenates the body. It is also good for skin. Almond oil can be applied as moisturizer for skin. Almond oil can used to treat all types of hair problems. Leave me a comment about your favorite healthy lifestyle tip and/or recipe.